I am a trainer, facilitator, process designer, presenter and organiser of study tours and events. After running a Belfast based non-profit for some years, I founded Second Nature in 2005. Together with associates I designed and delivered innovative approaches to running stakeholder engagement processes and strategies for sustainability. In 2012 I decided to join the Perspectivity Enterprise. 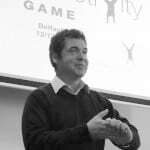 My specialisation is Large Group Interventions, using techniques such as Future Search, Open Space, World Café, Appreciative Inquiry and ICA’s Technology of Participation to maximise the effective participation of all those who have an active role to play. In 2012, for example, I used Future Search to work with communities in Darfur, Sudan to develop peace building strategies and to work on the issue of alcohol and drug misuse in Belfast. I also work in the field of sustainability. I am especially focused on enhancing organisational capacity to get to grips with this complex issue and to introduce change processes to make sustainability a successful business strategy. In 2008 I introduced a global framework for sustainability to Ireland, called The Natural Step and use this regularly in my work. I am based in Northern Ireland where I live with my wife Tara and four children. Michael is an optimist. He holds the gift to analyse and find the right words to describe each situation.